In an alternate universe, I drive a pick-up truck with a pig face insert for when the smoker isn't hitched. 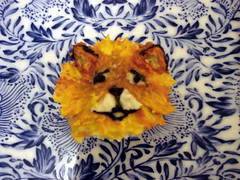 I am partial to Chow Chows, therefore I am partial to this entry in Martha Stewart's Cutest Cupcake Contest. You have until April 4th to enter your own cutest cupcake.